The Clearwater Festival is a music and environmental festival that is America’s oldest and largest festival of its kind. It is held annually at Croton Point Park on the banks of the Hudson River. The Festival features music and storytelling all run on seven sustainable bio-diesel powered stages for the 15,000 attendees. The Festival was founded in 1966 by American Peace Activist, singer songwriter and musician Pete Seeger and his wife Toshi who was a film maker and environmental activist. Pete, who passed away in 2014, was a dear friend of May Peace Prevail on Earth and was often seen with a Peace Pole while educating people on the costs of war. 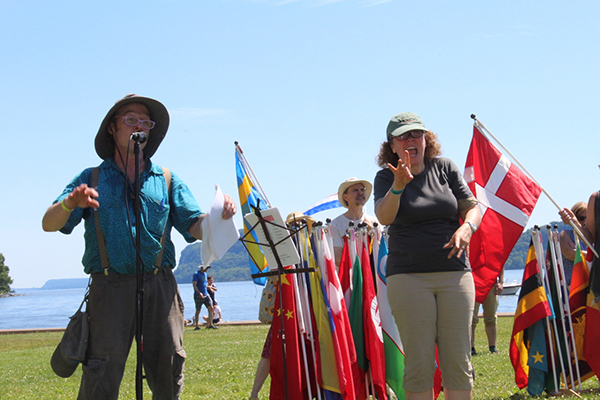 Jim Dugan with American Sign Language Interpreter explaining the World Peace Flag Ceremony to the gathering crowd. 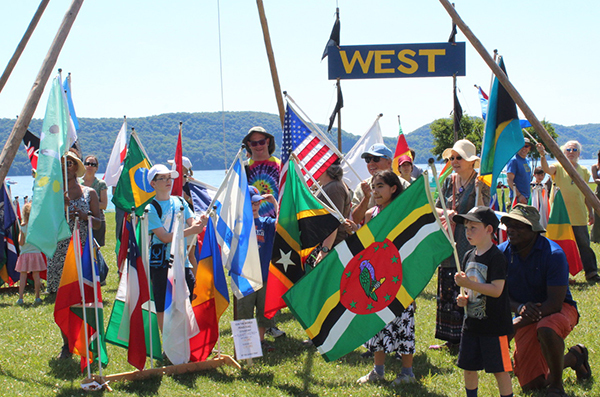 Jim Dugan, from the New York World Peace Sanctuary, has gone to the Festival for many years setting up a booth in the “Activist Area” to share our work and has been leading a World Peace Flag Ceremony each day of the Festival. This year we were thankful for the help of World Peace volunteers Carol Winters, Jackie Eaton, Sally and Andrew Damon, Haley Woodard, David Brann and Cynthia Sibusisiwe Shumba UN staff member from Zimbabwe, along with Festival provided American Sign Language Interpreters who completely signed each of the Flag Ceremonies. Festival attendees picking out the flag they want to carry during the Ceremony. The World Peace Prayer Society is proud to have been a part of this amazing festival for many years now and we look forward to many more years of involvement. Please look online for more information about the Clearwater Festival or on Pete and Toshi Seeger.